Identification: Upperside of male is blue-gray; female is black. Both sexes have large white spots which form median bands across both wings. Fringes of male checkered but black checks often reach only halfway to edge of fringe. Male has a costal fold enclosing scent scales on the upperside of the forewing. Underside is dull white with dark gray or olive bands. Spots of the hindwing marginal row are very small; spots of the submarginal row are larger. This species is separated from the white checkered skipper with confidence only by dissection and examination of the male genitalia. Life history: Males patrol in swales most actively in the afternoon, and mating takes place then. Females lay eggs singly on leaf buds and tops of leaves. Adults roost exposed on a tall plant beginning in late afternoon. 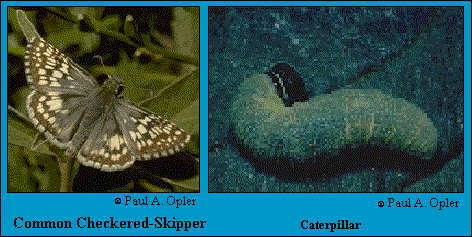 Caterpillars make folded-leaf nests in which they live and feed, and fully-grown caterpillars hibernate. Flight: February-October in the Deep South, March-September in the north. Caterpillar hosts: Several plants in the mallow family (Malvaceae) including globemallows (Sphaeralcea), mallow (Malva), hollyhock (Althaea), alkali mallows (Sida), velvet-leaf (Abutilon), and poppy mallow (Callirhoe). Adult food: Nectar from white-flowered composites including shepherd's needles, fleabane, and asters; also red clover, knapweed, beggar's ticks, and many others. Habitat: Open, sunny places with low vegetation and some bare soil including prairies, meadows, fields, roadsides, landfills, yards, gardens, pastures, openings and trails in woods. Range: Most of the temperate United States south to Gulf coast, w. Texas, se. Arizona, southern California, and mountains of northern Mexico. Colonizes as far north as central Alberta, southern Ontario, and southern New England. It cannot survive very cold winters and may not be a permanent resident north of the 40th parallel. Ferris, C.D. and F.M. Brown. 1981. Butterflies of the Rocky Mountain States. University of Oklahoma Press, Norman. 442 pages. Layberry, R.A., P.W. Hall, and J.D. Lafontaine. 1998. The Butterflies of Canada. University of Toronto Press, Toronto. 282 pages, 32 color plates.